Tropical Storm Philippe brough several inches of rain to the area causing extensive flooding. 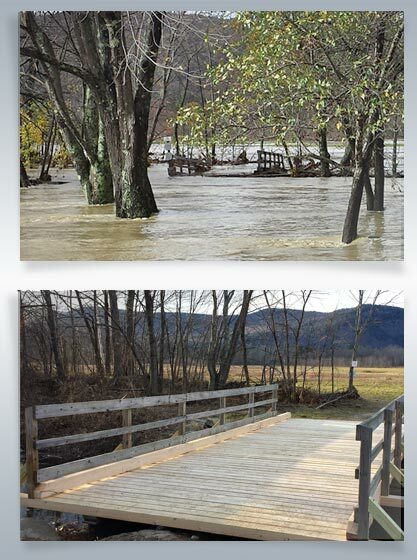 The Saco River, which normall flows through the Intervale, flooded the entire region causing excessive damage to the 1785 Bridge which connects the Intervale trails with the intown network. The bridge was impassable and had to be rebuilt. With the help of a crew of volunteers, the bridge has been repaired in time for the 2017-18 season! This was a costly and unscheduled repair. Your donation in any amount will greatly help with these unexpected expenses. Unlike most cross country ski operations, the Mt. Washington Valley Ski Touring and Snowshoe Foundation is a unique public-private partnership with the Town of Conway. The foundation is a 501 (c)(3) non profit organization dedicated to providing Conway residents, taxpayers, and school age children with access to winter recreation opportunities including snowshoeing and Nordic skiing at no cost. For more than thirty years the Foundation has groomed and maintained ski trails connecting North Conway, Kearsarge and Intervale, hosted hundreds of high school cross country ski races which include state and division championship events, and supported the Eastern Slope Ski Club's weekly Nordic ski program. Years ago the Town of Conway purchased Whitaker Woods and placed it in recreation use for perpetuity. The land was deeded with the caveat that recreation be provided at no cost to the residents of the town. Today, the trails in Whitaker Woods are used year round for hiking, biking, running, cross country skiing and snowshoeing. Unlike requirements for most recreational uses, the trails are groomed for skiing which is cost intensive. the trails in Whitaker Woods through the entire network . Trail maintenance which includes building and repairing bridges to key sections of the trails along with pre-season preparation which includes mowing, clearing of new growth and trimming of trailside vegetation. Signage - creation of enhanced signage along the trails as well as repairing signs that have become illegible. Equipment maintenance - grooming equipment must receive routine maintenance throughout the season to provide the great conditions we all desire, and occasionally requires repairs beyond those planned. Join us for our Annual Trail Days. Spend a day with us working on the trails during late October and early November and you'll receive a FREE Season Pass! Every year we are faced with the task of clearing the trails from summer growth by mowing, chopping, chipping and clipping in order to be able to provide the best grooming possible with the least amount of snow cover. We thank everyone that has helped us with these annual tasks and look forward to meeting new workers in the fall. Be sure to check our Calendar for trail days scheduled for the new season. Use the Trails - yes, ski or snowshoe the trails! If you are a Town of Conway resident - you are invited to get your Resident Pass at the Touring Center to use the network and tell your family, friends and visitors how much you enjoy the trails. Non-residents can show your support by purchasing a daily or seasonal membership, stay in our member lodging properties, visit our member restaurants for lunch or dinner, and participate in our events. Season memberships are always on sale in early December for a 20% savings!